The Hall of Fame pitcher nicknamed the “Christian Gentleman” may be rolling over in his grave tonight as Goldin Auctions sells off what PSA and JSA have certified as an authentic baseball bat alleged to have been “game-used” by Christy Mathewson in the 1905 World Series and signed and dated by his manager, John J. McGraw. But there is no proof whatsoever that suggests Mathewson ever swung the $500,000 bat and several experts have opined that the signature of McGraw is a poorly executed forgery. The authentication of the bogus signature by Steve Grad and Jimmy Spence is yet another prime example of why both authentication companies are facing allegations of fraud, incompetence, racketeering and operating a monopoly in three federal anti-trust lawsuits filed by Nelson Deedle, Todd Mueller and Michael Johnson. Sources indicate that several collectors have alerted the FBI about the sale. The McGraw signature on the Goldin Auctions bat has been identified as a forgery by several experts who claim the handwriting contrasts genuine examples executed between 1900 and 1910. In addition, the written date "Oct. 14 '05" significantly contrasts how McGraw wrote "Oct." and the number (5). It’s hard to believe both PSA and MEARS actually believe this and it’s interesting to note that they both make the same point as if MEARS based their 2015 letter on the 2013 letter by PSA. If this were actually true, the majority of “game used” items both companies have authenticated would not exist. 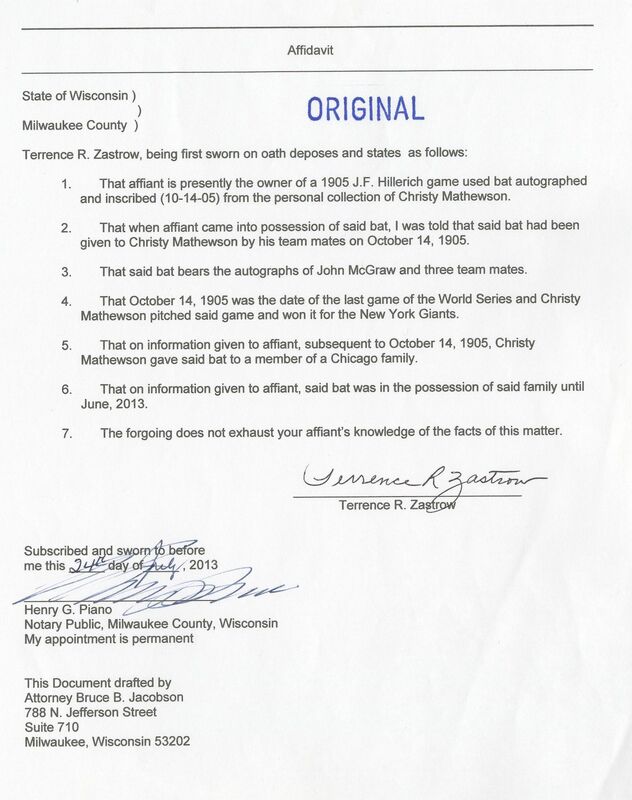 This sworn affidavit prepared and signed by Terrence Zastrow reveals nothing about the actual provenance and authenticity of the alleged Mathewson bat. Hobby sources are asking how PSA and MEARS could consider the affidavit when Zastrow is known as an admitted counterfeiter of US coins. 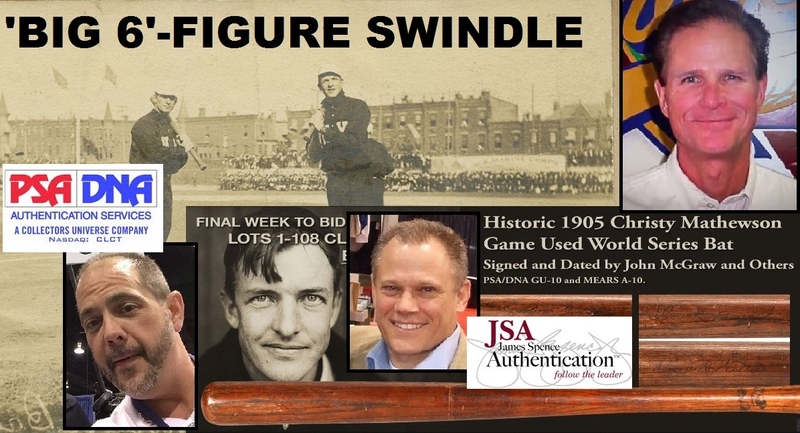 It appears that both MEARS and PSA simply accepted the autograph authentications by PSA/DNA and JSA in addition to the claims of direct provenance and ownership by Mathewson to elevate the bat to a $500,000 museum quality artifact. The truth of the matter is that MEARS and PSA can only identify the bat as a vintage and authentic Hillerich bat from the turn of the century. Neither outfit provides any convincing evidence that shows otherwise, including photographic evidence which shows Mathewson holding a bat in 1908. A photo sold this year by Heritage shows Mathewson holding his bat during the 1905 World Series (left). The handle of the bat appears to be thicker than the bat being sold by Goldin (right). Last week, a major collector contacted Hauls of Shame and provided us with an actual authentic photo of Mathewson holding his bat during the 1905 World Series. The collector noted that the knob and handle “looked thicker than the bat that Goldin is selling.” The image is not clear enough to reveal the exact details and wood grain but it does cast more doubt on Goldin’s alleged treasure. Additional views of the alleged Goldin Mathewson bat (left) next to the genuine bat shown being held in Mathewson's hands during the 1905 World Series. Ken Goldin acknowledged Zastrow’s past as a counterfeiter but also stated, “My consignor is not Zastrow or a relative. This bat has been in an esteemed private collection for two years.” Based on Goldin’s response it appears that Zastrow sold the bat to the collector and it is interesting to note that Goldin includes another letter addressed to Marshall Fogel referencing a different family that owned a Mathewson jersey they received as a gift. That letter has absolutely nothing to do with the Zastrow bat and appears to be included in an attempt to deceive bidders. Several sources told Hauls of Shame that the consignor of the bat is New Jersey collector Dr. Richard Angrist. Angrist’s name appears on the copy of the Fogel letter which is included in Goldin’s 23 page report on the bat. Terrence Zastrow was indicted for counterfeiting US coins in 1973 and was caught admitting to creating and selling fake coins on a wiretap as noted in the 1973 indictment (excerpts above). Hauls of Shame contacted Zastrow’s son, Justin Zastrow, to ask whether his father could explain his affidavit but he did not respond to our voice mail. The Zastrow family owns and operates Authentic Investment Inc. which is described as “a family owned company.” PSA, Joe Orlando and John Taube have a long history of not responding to our requests for comment. The current bid on the alleged Mathewson bat at Goldin’s sale in Chicago is $140,000 with five alleged bids. UPDATE (SAT. Aug. 1st): According to Goldin Auctions the alleged Mathewson bat sold for $218,700. In addition, Ken Goldin contacted HOS and wanted to clarify one issue about the Fogel letter included with the lot. Goldin told us: “Goldin did not supply anything regarding Marshall Fogel. When the item was consigned to us it came with 23 pages of documents handed to us by the consignor. The letter regarding Fogel was not something that we supplied, but is part of the authentication papers of PSA DNA.” Goldin also stated that the sale of the bat at $218,700 was a real sale and that the bat met its reserve price although it sold for less than half of the $500,000 Goldin expected. I thought MEARS was on the level but this Troy looks like a straight up fraudster here. What a joke. Did Dave Grob look at this bat??? Say it ain’t so. And I have Adolf Hitler’s mustache, also given to Christy Mathewson and signed by Karl Donitz. Or is it Nimitz? Doesn’t matter. I wouldn’t touch this bat with a stick. Shop at Home Kenny G strikes again!!!!!! It’s disappointing to see MEARS caught up in this type of shenanigans! …WHY DIDN’T YOU GUYS ASK DAVE GROB ABOUT IT!? ..He’s written for HOS before! …WHAT GIVES!?? …Are you guys giving him a PASS!?? Why no picture of Troy? Umm, sloppy reporting much? In your evidence of “Indictment” for Zastrow you used a PRE TRIAL excerpt that is not even from an official or government source. So what happened AFTER the trial? Was he even found guilty? He WAS indicted, so how is that sloppy? There is a case file for him. He was indicted. that’s a fact. Are you disputing he was indicted? Troy don’t even show up to the national anymore. Several items in his past auction are a joke. One being a Farrell last name H&B bat, yet they attributed it to Wes and Rick Farrell. Guess what, during the same time there were many minor leaguer players with the name Farrell. And he did this with several bats with just a last name. Also him selling a 125J with the last name Jackson on it as a Joe Jackson post career barnstorming bat. And he states the 125j don’t show up in a catalog. But again, it actually is in the catalog. Yet he got $10,000 plus for the junk bat. Our policy is to post court decision text exactly as it appears in released court documents. Note that cases marked “Do Not Publish” or similarly, by the courts, indicate the decision is not to be used as legal precedent, however the decision is still available for public access. This was all pre-trial. And the sight you posted is far from a government entity. You say “however the decision is still available for public access.” Okay, so why did you not provide us with the official final decision? You called the man a counterfeiter numerous times without showing any proof that he was indeed found guilty of that. So, what was the final outcome? Hi Mandi Nicole Hawk relative of Terrance Zastrow. Background checks are easy fyi. Your comments make so much sense now. where does anybody say “final decision”? you said that. it IS from the official court decision on the pretrial motion. leagle.com only quotes court documents word for word. I didnt say – “however the decision is still available for public access.” leagle.com says that. I didn’t call anybody anything, I am not the editor of the piece. why do you keep saying it’s me that is calling people things. Where is Karl Sundberg on the byline of the piece? The piece said he was indicted for counterfeiting coins, and he was indicted for that. Do you know what indicted versus convicted means? Hmm, well my name is certainly not Mandi Nicole Hawk… But whatever. Do my comments not make sense?! I thought I asked pretty simple question? According to Goldin Auctions the alleged Mathewson bat sold for $218,700. Looks to me like Zastrow was indicted for counterfieting US coins. Looks like he was caught on wiretaps admitting to counterfieting and selling phony US coins. Seems his motion was trying to say his confession was the product of an illegal wiretap. Maybe he got off, so did OJ. Looks like he was a counterfieter and thats pretty relevant when reading his ridiculous affidavit. I also see HOS called the Zastrows but they never responded. Hmmm thats interesting too. Maybe Mandi can clear all this up for everyone. Keep exposing these frauds HOS. How could Goldin Auctions not pull this lot. Did the auction house call Zastrow or the owner and get additional info on the bat. How about some answers. Wheres the FBI on this situation. Our apologies for the appearance of the text running off the screen for some readers. We are trying to rectify the situation. This is the reason I got out of collecting about 20 years back. You can’t trust anything/anybody you see. If there is a dollar to be made someone will do it. No matter how they do it. Very sad. I was slowly getting back into collecting but I think reading this site will push me back out of it. I will hold on to my money. The screaming Shop At Home guy? I got junk from that deal. This screams like Pepitone’s book put out again. can these scum get arrested already! Looks like MEARS has taken the Lou Lampson approach to authentication. You make it seem as if the bat in the 1905 picture taken during the 1905 World’s Series is definitively Christy Mathewson’s bat. Is it not entirely possible that a photographer said “Hey Christy, can I get a picture of you swinging a bat?” And Christy happened to pick up the nearest/closest bat?? Reading this article is simply fun…these “so call” experts now can read the minds of players 110 years ago. Bravo John Taube! It’s amazing how much-full of POOP-these guys are filled with. Caveat emptor…let the buyer beware. You guys how no idea where these guys came from unless you were in the hobby 25+ years ago. One was a hotel clerk, one was a shoe salesman, another was in prison, oh yes, one has a ‘BS’ degree from a still unknown college facility. Believe me, at night around the dinner table, they laugh at us. Yo! Adrian, I just got Babe Ruth to sign a ball, I’m in line to get a LOA…be home soon. Am I allowed to discuss this bat on Net54 or is that also not allowed now because not enough time has passed since Luckey’s fraud? Glad I got every Topps set mint from ‘56 onward from Renatta Gallaso in the mid seventies with my IBM stock from Dean Witter in Greenwich.